Metabolic Bone Disease (MBD) is a preventable condition occurring in diurnal reptiles (active during the day). It is a disease that stems from poor husbandry and animal neglect. Lack of UVB, lack of proper calcium and d3 supplementation, incorrect basking temperatures and an imbalance of dietary calcium, d3 and phosphorous all lead to MBD. The symptoms of MBD are varied, but the most common are lumps or bumps at the base of the tail or along the spine, crooked spine, deformity of the jaw with the top jaw often being shorter, softening of the bones and jaw, and broken bones. Severe cases of MBD will exhibit lethargy, inability to climb or grip, weakness, and organ insufficiency and failure, commonly cardiac and liver failures. Avoid feeding foods that contain more than twice the amount of phosphorous than calcium, and also avoid feeding vegetables that bind calcium as they will make less calcium available for absorption. 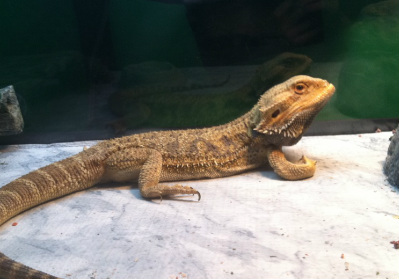 An example of metabolic bone disease deformities in a bearded dragon. Note the jaw malformation and the bowed front leg. Photo of Gideon courtesy of Samantha Myers. Tricia's Water Dragon - Excellent explanation of why calcium deficiency and metabolic bone disease are a problem with reptiles in captivity and what you can do to prevent the disease. Short, technical document about MBD with a picture of an iguana's deformed jaw for illustration. Long, detailed page with diagrams and an in-depth description of the disease. Article explaining causes of MBD, also has a vegetable food chart showing calcium to phosphorus ratios. An illustrative poster that gives the basics on MBD in crested geckos including signs of the disease and how to check calcium sacs.